Residents at the Industry Town Meeting. 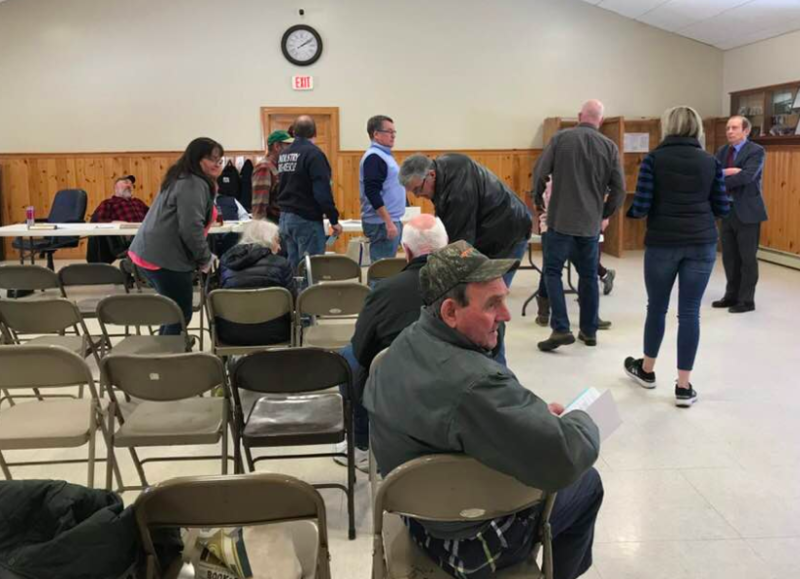 INDUSTRY - A short annual town meeting brought roughly 30 residents to the Town Hall Saturday afternoon to discuss a 36-article warrant. Polls opened earlier in the morning to determine a new three-year selectman for the board, following the end of Third Selectman Dovey Balsam. Write-in candidate Stewart Durrell won with 27 votes, beating another write-in candidate Connie Webb who received 14 votes. Residents approved the recommended budget of $508,415, a 11.26 percent increase from 2018. Article 17 which raised and appropriated $21,873 for the Industry Fire Rescue Department, brought some discussion with residents regarding potential federally funded grants the department could apply for. Other departments throughout the state have applied and received such grants, according to Chief Kevin Gurney, which often partially pay for staff salaries as well as equipment. "We get about 70 calls a year. Which is why we haven't gotten any grants in several years," Deputy Chief Wes Witherley said. Gurney said he would look into the possibility of grants for the department. Selectman Robert Geisser said he would explore the option of converting the roughly 16 town streetlights to LED after questions were raised about the expenditure. The crowd approved spending $5,500 on the operation of the lights, despite several comments from the crowd about the lights often being out. A final article, 36, approved the expenditure of $2,000 for large trash drop off day, which Chair Board Lee Ireland said he expects to take place the third week of July. Congratulations Stewart!! I hope that you enjoy serving in this position! !